The upcoming Canada Day long weekend has me thinking about a tasty drink to prepare when spending time with family and friends by the pool, at the beach or while watching fireworks. Rooibos Tea originated from South Africa and is quickly spreading in popularity in the West for its touted health benefits. It’s full of anti-oxidants and flavonoids, which is great for promoting youthful skin. When spending hot days out in the sun, this refreshing drink can help detoxify our bodies while quenching our thirst. You can also add frozen berries or pomegranate seeds to customize it to your liking. 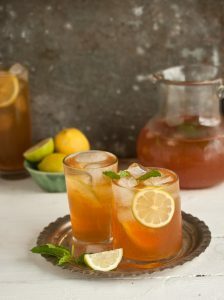 Tell me about your favourite summer drinks! 1. Place 2 teabags and boiling water in a glass jug. 2. Let tea to steep for 15-20mins. 3. Slice half of the lemon into thin slices and squeeze the other half into the jug. 4. Remove tea bags and add sweetener to your liking. 5. Add a handful of fresh mint leaves, cold water, ice and stir.